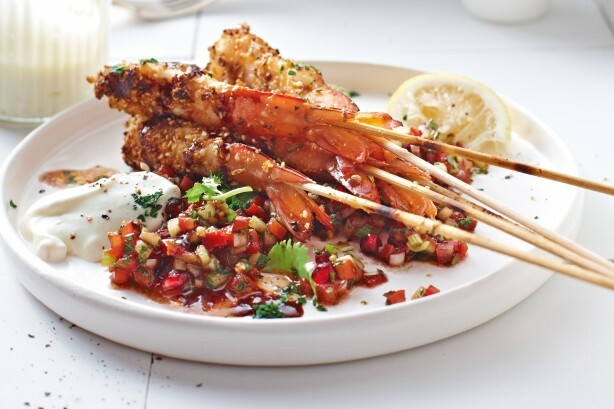 Have a mouth-watering dinner bursting with flavors in this Dukkah Prawns with Spoon Salad. The refreshing and flavorful goodness is sure to make you crave more! For the spoon salad, place the vegetables in a fine sieve over a bowl to drain for 1 hour. Transfer to a bowl, stir in remaining ingredients and season. Soak 16 wooden skewers in hot water for 10 minutes. Combine oil, garlic and preserved lemon juice in a bowl, then use to brush the prawns before coating them in dukkah. Thread the prawns onto the skewers and chill for 15 minutes. Combine preserved lemon rind and yoghurt in a bowl. Season and set aside. Heat a frypan or chargrill pan over medium-high heat, then cook the prawns for 2 minutes each side until opaque and just cooked through. Serve the prawns with the preserved lemon yoghurt and spoon salad and garnish with coriander leaves and lemon wedges. Preserved lemon and pomegranate molasses are from delis and gourmet food shops. Pomegranates are available in season from greengrocers.